Chicken fajitas are a great dish for both beginner and advanced cooks. They're straightforward to prepare and have just a few ingredients, making them a perfect meal for busy weeknights when you don't have much in your fridge. 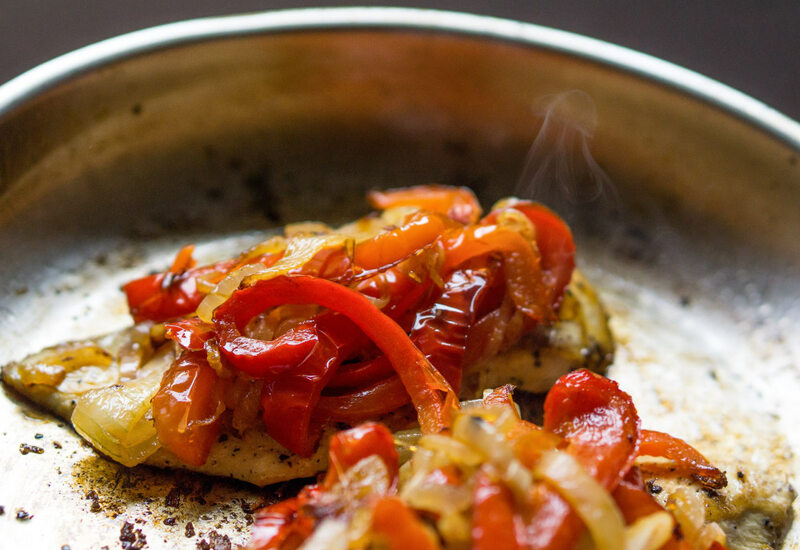 Quickly sautéed onions and peppers top a simply cooked chicken breast, and are covered with melted cheese. Serve with warmed flour tortillas and a variety of your favorite toppings. We love sour cream, Mexican hot sauce like Cholula or Tapatio, sliced avocado with a squeeze of lime, or chopped green onions. Cook chicken with sliced Spanish chorizo to add a burst of smokey-spicy flavor! Alternatively, make steak fajitas: Sear two 1-pound steaks in the skillet with peppers and onions moved to the edge for 5 to 6 minutes per side. Let rest for 10 minutes, then thinly slice. Per Serving: 412 calories; 21g fat; 10.2g carbohydrates; 45g protein; 130mg cholesterol; 567mg sodium. Before this recipe I had no idea how easily I could make fajitas at home. I used canola oil rather than grapeseed oil, and that worked great. Crowd favorite! These chicken fajitas were really good. I made them in our cast iron skillet. They taste good without or without cheese and go perfectly with a side of tortillas. This recipe didn't have any seasoning, but I added paprika, chili powder, garlic powder, cumin, and oregano. I also used two peppers instead of one. It was pretty good, just wish that this recipe would have included more flavor. I cooked the chicken with sliced Spanish chorizo, like the recipe suggested! I thought it was really good. I served it with flour tortillas. Next time I'll try steak. Made steak fajitas with peppers and onions. Skipped the cheese, and just served as is. My wife likes to wrap it up in flour tortillas. It's one of our favorite weeknight dinners.